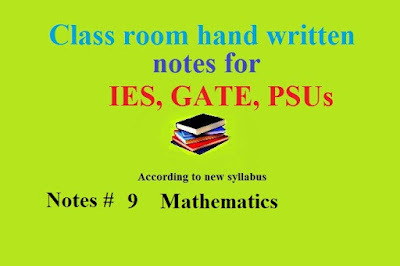 Class room notes of Engineering Mathematics for Electronics and Telecommunication Engg., Electrical Engg., Mechanical Engineering, Computer Sc. and IT , Civil Engineering, Instrumentation and all others branch are shared here for GATE, IES, PSU, BSNL, Railways Exam. and others competitive examinations.